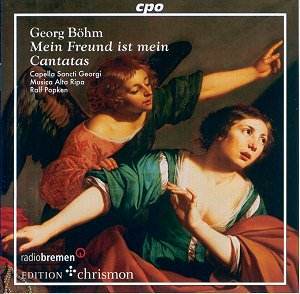 Georg Böhm is a household name among organists, who frequently play his chorale partitas. There is also a growing interest in his harpsichord suites. He is often mentioned because of his influence on the young Johann Sebastian Bach. But his vocal output has been overlooked. It is difficult to say how many vocal works Böhm wrote. It is known for sure that some of his sacred music has been lost. What has come down to us are a small number of cantatas, two motets and a number of sacred songs for solo voice with basso continuo. This disc contains four of the cantatas. The booklet doesn't indicate when these cantatas were composed, and it is likely there is no information available about that. The first two seem to be the oldest, as they reflect the German tradition of sacred music writing in the 17th century. They consist of a sequence of solo and tutti sections, and both are scored for five voices, with two sopranos, and five-part instrumental ensemble (two violins, two violas, bassoon and b.c.). This was the usual scoring in the 17th century, but went out of fashion in the early 18th century. The first cantata is based on Matthew 22, where the concept of the kingdom of heaven is explained by the parable of a king who gave a wedding feast for his son and sends his servants out to invite the guests for the feast. As they didn't want to come, the king orders his servants to go out on the streets to invite others to his feast. The words "und die Tische wurden alle voll" (and all the tables were getting full) are set for the full ensemble. When the king asks one of the guests why he isn't wearing a wedding attire, the text says: "Er aber verstummet" (He was speechless), which is followed by a general pause. This passage is repeated several times. The man is thrown out into the darkness, and "there will be wailing and gnashing of teeth", which is vividly depicted in the music. The meaning of the parable is underlined by the inclusion of three stanzas of the chorale 'Wachet auf, ruft uns die Stimme', which urges us to be prepared for the coming of the kingdom of heaven. The second cantata is based on a passage in the gospel of St John, chapter 4 (not 5, as the booklet says), which describes how a nobleman approaches Jesus to ask him to heal his son, who is deadly sick. This is expressed by a very moving lamento for tenor, followed by the first stanza of Luther's hymn 'Aus tiefer Not', set for soprano solo. The second part of the cantata opens with the bass, in the role of 'vox Christi', singing: "Go, your son lives". The nobleman replies "I believe your word" and the tutti sing "Honour and glory with high praise for this good deed". The two other cantatas must have been composed somewhat later, as they show some influence of the Italian style of the early 18th century. In both cantatas the soli are referred to as 'aria'. 'Mein Freund ist mein' is using an anonymous text which is based on a passage from the Song of Songs (ch 2, vs 16): "Mein Freund ist mein, und ich bin sein" (My friend is mine, and I am his). Every section opens and closes with these words, which gives them a da capo structure. The cantata begins and ends with a tutti section, and in between are the four 'arias' for the respective soloists, which all have an ABA structure. In two of them we find early forms of the recitative which was to become a regular element in the German church cantata of the 18th century. All sections are interspersed with instrumental ritornellos. Like the third cantata, the fourth is also in four parts, both vocally and instrumentally. There are still two viola parts, but no independent part for the bassoon. In 'Wie lieblich sind deine Wohnungen', a setting of Psalm 84, two trumpets are added to the instrumental ensemble. The cantata opens with a chorus, which is repeated at the end. In between there are again four 'arias' for the respective soloists, but they don't have the binary structure of the soli in the previous cantata. All soli are like solo songs, without repetition, and all sections are divided once again by ritornellos. The interpretation by the soloists, the choir and the instrumental ensemble on this disc can hardly be surpassed. All soloists are specialists in baroque music, and have wide experience in performing German vocal music of the 17th and 18th centuries. As they are all native speakers of German, their pronunciation is impeccable, and they also excel in articulation and diction, and give the text full attention. The ensemble Musica Alta Ripa is one of Germany's finest instrumental ensembles, and has made many splendid recordings. The choir, which I hadn't heard before, realises the tutti passages in a most convincing way. The question is, though, whether in this repertoire a choir is needed. I think that the character of these cantatas and the historical data available, strongly suggest a performance with one voice per part. I recommend this recording: these cantatas are splendid works, which deserve to be widely known, and this interpretation does them full justice.